I use a lot of screen shots in emails to students, especially when I’m explaining how to use a piece of technology. Microsoft Windows has a very easy way to capture all or a portion of your visible screen and copy it to an email or save it to your hard drive. The Windows Snipping Tool is found under the Accessories Tab in the Start Menu. When you open the Tool, you can choose how much (and what shape) to snip. This is an advantage over the windows Print Screen (prt sc) button, which requires you to crop the image if you want anything less than the full screen. 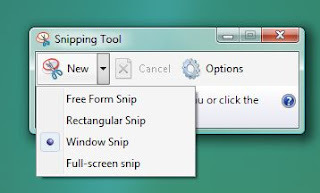 The following video gives a useful set of instructions for finding and using the Snipping Tool in Windows 7. If you have another version of Windows, or you want to learn more tech tips, contact Meg Elias at clarkm1@star.lcc.edu or visit the CTE.